America’s Cardroom has a long history in the world of online poker. Established all the way back in 2001, it was one of the first real money online poker rooms. In late 2011, America’s Cardroom bought out Doyle’s Room, a room named after the poker great Doyle Brunson. They changed the named and moved the site to the Yahatay Poker Network. In January 2018, the Yahatay Network rebranded to the Winning Poker Network. Along with America’s Cardroom (www.americascardroom.eu), the network has six other online poker rooms combining to form their player base. America’s Cardroom is one of the safest US facing rooms available. As mentioned previously, the network has over ten years of experience in the online poker industry and an impressive payout record. Their support is fair when monitoring player disputes and is willing to listen to suggestions. America’s Cardroom support makes it a point to reach out to players in the top internet poker forums, listening to suggestions to improve their product. The room boasts a dedicated security team that monitors the tables 24 hours a day. They are quickly able to spot collusion or partnerships amongst players, keeping the tables safe and secure. Due to recent legislative actions by the US government, some states have been banned from the network. Player from Washington, Maryland, and Kentucky are not allowed to play for real money on the Winning Poker Network. Old school poker feel with fresh fast-paced action. Resizable tables, cascading tables for multi-tablers. Unique options such as, fold/show, straddling, and chopping blinds. Lag free even when playing a large amount of tables. Cashier loads quickly, with up to date bonuses and stats. Supported by Pokertracker and HoldemManager. Lobby is slightly dated and does not have a filter. Tournament and cash lobbies open different windows, taking up more space on the screen. Lobby is cluttered with casino and sports betting buttons, and poker room ads. America’s Cardroom is frequented by mostly US players but is open to players worldwide. 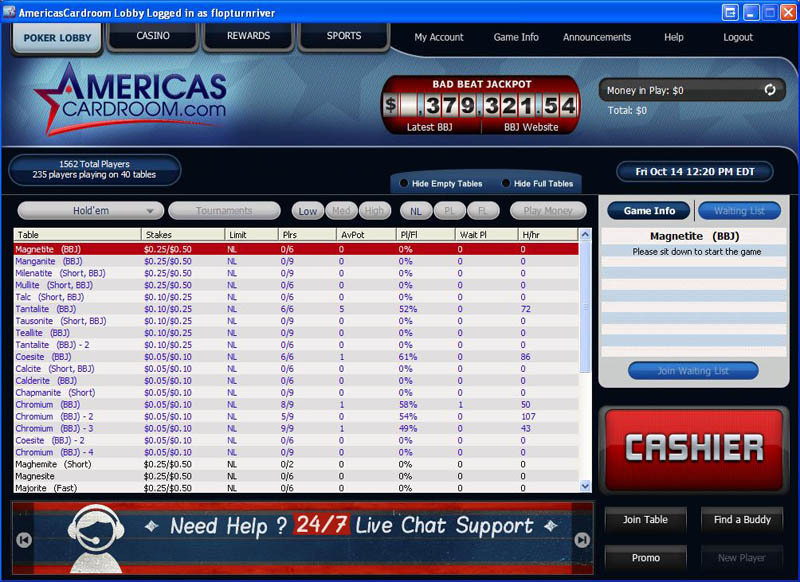 The room offers many deposit options for players to get their money online. E-wallets – Neteller, Moneybookers: Both highly secure methods and the preferred choice for depositing online. Funds will be available for play instantly after depositing. Neteller comes with a $50 minimum deposit, and a $2500 maximum per transaction. The minimum Moneybookers’ deposit is $50 per transaction, with the maximum being $1000. These methods are not available to US players. Visa Card: An instant deposit method using VISA credit cards. The minimum deposit per transaction is $49, and the maximum deposit is $999. This is probably the best method for US players to get money online. Though many cards may be declined due to local banking restrictions, players can buy pre-paid gift cards that have a higher success rate. Person to Person Transactions – Western Union and Money Gram: Both of these person to person money transfer services may be used to fund accounts on America’s Cardroom. The transaction is easy, request a “Recipient’s Name” from America’s Cardroom support and then visit your local Western Union or MoneyGram office. Process the cash transfer and give customer service your tracking information. In most cases, player accounts will be credited within 30 minutes. America’s Cardroom will pay fees if players send $300 or more. America’s Cardroom leads US facing poker rooms in withdrawals. Their payout speeds are much faster than all other online poker rooms servicing US players. Neteller, Moneybookers: Players who deposited using these e-wallets may withdraw using them. Both methods have a $50 minimum amount per transaction and a $3000 maximum. There are no fees on withdrawals, and they are normally processed within 48 hours. Debit Card: America’s Cardroom offers players a pre-paid debit card that can be used to receive payouts. The card is a VISA or MasterCard and can be used at point of sales. The card is sent out within 1-2 weeks and comes with a $25 fee. Player funds can then be sent to the card at no additional charge. Once the player receives the card, payouts will be processed within 1 to 2 days. The minimum payout is $50, and the maximum payout is $2,500 per transaction. There is a monthly fee of $4.95 and players cannot have more than $10,000 on their card balance at any one time. BankDraft (Check): Check withdrawals are currently taking 1 to 2 weeks to reach players. Players are given one free check withdrawal a month, with each additional check incurring a $65 fee. Checks come with a min and max withdrawal of $100 and $2995 respectively. Western Union and Money Gram: Players will receive a person to person transfer from either of these services. The min withdrawal is $100, and the max is $995. This method comes with high fees, ranging from $60 to $110, depending on the amount. Person to person transfers take just 48 hours to process. The Winning Poker Network is not a high traffic network. At peak hours, it may only have 1,000 real money players. Even with multiple skins traffic is slow, but it has steadily gotten better over the past year. 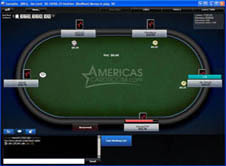 America’s Cardroom offers players nearly every type of poker game. Hold Em’, Omaha, Omaha Hi/Lo, 7 card stud, 7 card stud Hi/Lo are all offered. The problem is No Limit Hold Em’ is only game that has a player base. The micro limits are usually consistent, and games run up to the $5/$10 stake level at peak hours. There are normally 5-6 $1/$2 games and a few $2/$4 games going at peak hours. Traffic is terribly slow for Pot Limit Omaha and is nonexistent for the other games offered. America’s Cardroom offers several weekly guaranteed tournaments. The two largest offered are a $10k Guaranteed on Saturdays and a $50k Guaranteed Tournament on Sundays. In addition, there are many other small buy in tournaments throughout the week. Both normally have considerable overlays and are a terrific opportunity for tournament players. Sit N’ Go action is scarce as just heads-up SNGs will occasionally fill. America’s Cardroom may be a small room, but the games that are going are full of fish. The network markets to sports and casino bettors making the games more lucrative for sharks. The flop percentages are high and average pot size is generally more than most other sites. America’s Cardroom has top of the industry support. They offer a live chat feature, email support, and phone support. They are extremely courteous and are usually reachable within minutes. They take a hands-on approach to customer service and will listen intently to all player complaints, suggestions, or disputes. America’s Cardroom offers players a stunning first deposit bonus, 100% up to $1,000! New players will also be eligible for a weekly $250 New Depositor Freeroll Tournament. The bad beat jackpot is a staple at America’s Cardroom with at least half the tables in action being BBJ tables. The jackpot helps draw players to the site and can grow up to hundreds of thousands of dollars. America’s Cardroom also offers players a VIP program. The Elite Benefits VIP Program will allow players to earn Combat Points and Rank Points, which contribute to rewards and bonuses. Players earn Combat Points for paying rake in either cash games or tournaments. Earning Combat Points allows players to earn Rank Points and climb the VIP Monthly Ranks, increasing their VIP level. Players can then turn in their Combat Points into cash bonuses, live tournament tickets, or luxury items at the America’s Cardroom store. America’s Cardroom is a small room but has grown tremendously in the past year. It offers a fishy player base, a solid VIP program, and exceptional customer support. It also leads the US online poker industry in payouts – a stat cannot be ignored! America’s Cardroom is the perfect place to start playing poker, it is fast, secure, and offers great action and bonuses.